Ever read your draft content and feel it lacks a spark? Let’s be honest. A lot of business content is rather meh. It sounds boring. It lacks a human voice. It feels like anyone in any marketing department could have written it. And that’s not what we want, eh? You and I want to connect with our audience. We want to write with personality, so people “hear” our voice. We prefer a cozy conversation to a corporate pitch. But somehow, when writing, we lose our voice. Maybe you think you don’t have the talent to write well. Or even worse… you may think you’re not interesting enough. You might not believe me, but it’s true … I’ve never thought of myself as a writer. I used to think I was too boring to be a storyteller. I didn’t think I was creative enough to write more than a few emails to friends. But I’ve figured out that creativity is not for the chosen few. And when you nurture a sense of play, anyone can add personality to their writing voice. Want to turn humdrum business writing into sparkling content? Let’s have some fun today, shall we? Settling for the first word that comes up in your mind? That’s usually a word commonly used. To add a splash of personality, try to come up with a slightly more unusual or more precise word; experiment with emotional or sensory words. This exercise works best for a single sentence, so write a tweet, choose an email subject line, or consider a blog title. Now, try rephrasing it in as many ways you can—using different words. Consulting a thesaurus is allowed. Which version do you fancy? Be warned: This exercise is quite addictive, and may take longer than you think. Have fun! This exercise helps you express your personality by using tiny details. On About pages, for instance, you often read boring sentences like So-and-so loves travelling, photography, and spending time with her two kids. Why is this boring? Because you can’t visualize such sentences. They’re too generic. When readers can picture your words, your writing instantly becomes more fascinating. To allow your readers to visualize your words, simply select a few details. Note how each sentence gives you a glimpse of personality? Metaphors are simply connections between two unrelated topics—and with a little practice anyone can create them. No creative genes required. No talent necessary. Start with picking an important point you want to make in a blog post. Let’s take the key point of this post as an example: to add sparkle and personality to your writing you must nurture a sense of play and experiment a little. Imagine being a kid and you’re given permission to decorate a table full of cup cakes. You’d play with different ideas and make each one a little different, wouldn’t you? With writing, you want to nurture a similar sense of experimentation. Try different words. Play with tiny details. How does it change your voice? Adding sparkle to your content is like cooking peanut sauce. First, you cook the sauce, then you taste whether you need to add a little more lemon juice, sweet soy sauce, or ground coriander. Keep tasting and adding ingredients until you have the perfect taste. Writing works the same. Write a first draft quickly, and then add different ingredients to make your content tantalizingly tasty. How about a few extra power words here? Or a metaphor there? How does that sound? If in doubt, ask a friend for a second opinion. As kids, we knew how to tell stories and draw pictures. Without worrying about results. Without worrying about what other people would think. We got into a creative flow without that distracting inner critic. As adults, we need to get back into that innocent creative flow. Is your inner voice telling you you’re not creative enough? Ask him to go out for a half-hour walk. Then embrace your inner child and have half an hour of fun. No pressure. Results don’t matter. Choose the exercise that appeals to you most. Grab a drink, a sheet of paper and pen, and give yourself some time to play. Don’t rush. Thanks so much! Very interesting and useful post. This has been one of the most practical posts you have ever written. Although some of these suggestions may be obvious to you, they aren’t. The compelling way in which you introduce each excercise is very helpful. Loved tip #2! Maybe more practical examples in the future? An ebook with exercises would awesome! I will be looking for it. This was fantastic! I teach adults who are learning a new hobby and the struggle is to get them to play, to move them into the ‘right’ side of their brain, so they can experiment and experience flow. Without the play, they are too analytical, and their performance is rigid. Have you read the book Play by Stuart Brown? It’s an interesting take on how important play is not just for our imagination, but also for our happiness. Yes, it’s normal to get stuck in the same old rut. We all experience it from time to time. I find reading fiction can also help us get out of a rut. Happy writing, Ralitsa! And thank you for stopping by. PS It’s cloudy with sunny intervals today and the wind is surprisingly cold. Yes, I like your advice, Henneke, first to have fun with writing, with a pen and paper. Our creative ideas flow. We can make a first draft and then fine tune it. Good article, Henneke, Thank you. Yes, I find a computer can sometimes stifle creativity. Perhaps because I associate it too much with trying to be productive? Henneke, I often cook when I’m having a writing day. I’ll intersperse my writing time with cooking something simple but delicious. This brings in a sense of play and freedom. It helps free up my writing. Love your examples! Very helpful! Thank you. Looking forward to writing some juicy headlines! At first, I thought that if I wrote this way, I’d be using a voice that was too “Henneke” for my readers, but I see, now, that if I gravitate to your voice, why shouldn’t I adopt some of the qualities that do fit my topic! Probably I am a turtle in this race to create web content, but Slow and Steady is the preferred pace for multitudes, right? Oh, me! Good to see you again, Cathy! Like bland food, meh writing is everywhere. This is good news for a bad reason–you have little competition,. So a sparkling piece of writing sweeps and soars above the dismal landscape. Your recipes to spice things up should do the trick! Love reading your posts, Henneke! Yep so true, when we make a little more effort to polish our words, then it’s quite easy to stand out from the crowd! Great post here. Really love exercise #1 and playing with words. Every post a person writes has so much potential to be better. I think most writers, me included, get lazy and don’t ‘do the work’ to make our blog titles pop. And if we really want to stand out, we have to start doing that. So #1 is definitely what I’m planning to focus on for now. Great overall post here. Thoroughly enjoyed it. Yeah, I know … it’s hard to make time to play with your headlines sometimes. But it pays off! It can help to move away from your normal work place, perhaps go to the park or a local cafe. I’ve also found that a short train trip can be great for a short burst of creative energy. Skipping to the swings and slides now with a fairy cup cake in my hand. That’s how happy your post made me feel. Thanks for your sweet and tasty writing sprinkles Henneke. Do please create your ebook/cookbook of similar excercises. You have hundreds and thousands of fans waiting hungrily to download it. And thank you for the thumbs up on the ebook idea. I appreciate your input. Yep, so true! I love learning more about writing and collecting new words. Thank you for stopping by again, Laurie! Since I began freelancing full-time in July 2014, I’ve signed up with quite a few writing “gurus.” I ended up opting out of several. Others, I get but usually delete. They send too much email and there’s too much selling. I appreciate the volume of your communication but mostly, I appreciate the value. Today’s post in particular. I write business content full-time and yeah, it gets grey and “boooring.” Thanks to this post, I was able to spice up the title, which helped increase my interest in what I was writing, which brought up from gray to a subtle shade of green (hey, it’s an improvement). This post really motivated me as I’m writing a new post. There’s always a need for improvement and you have given me some ideas I can apply to my old posts. I can put a little more personality by adding more descriptive words into each point I convey. But in all it makes the posts more engaging, keeping your audience interested. Thanks for sharing Henneke! Have a good one! Even choosing only three sentences or so and making them a little more sensory can make a big difference to a post. Happy writing, Sherman. And thank you for stopping by again! This comment is unrelated to this article but the email I received that landed me here. Regarding the email, I initially thought it was spam. Why? #1 the sender’s name was “Henneke Duistermaat”, a name I didn’t recognize. So I would consider changing the sender’s name to “Enchanting Marketing” so future subscribers can immediately recognize the sender and know its not spam. #2 When I opened the email, I still thought it was spam until I browsed to the bottom and saw “Enchanting Marketing”. At this point I still wasn’t sure how I knew Enchanting Marketing but it sounded familiar enough for me to read and click the link. To solve this problem I would add a visual reference within the email. In your case the visual reference I would add is the book cover “How to Write Seductive Web Copy”. If I saw that, I would immediately recognize and know who its from. You might have first learned about me and Enchanting Marketing via my book, so the book would be a good visual cue for you, but most people find my blog first and then decide to buy one of my books. I’ve also been told that in general, emails that look like they come from a person (without design elements) tend to get read and clicked more often than emails with a slick design. I appreciate there are pros and cons to every approach; and will think about what I can do to ensure people know my name before they get my first email. I might be able to improve the confirmation email or confirmation page. You’re right on how I learned about you. I’m not sure how I found your book but when I did I think I clicked on a link within the book that took me to your site. From there I signed up to your e-newsletter. As for a visual reference, I do agree for some people if the content has visual design elements, engagement levels might be lower because the content appears and feels more commercial. But I wasn’t thinking about adding or changing design elements to the email content but more along the lines of adding an image somewhere within the email. I’ve seen other emails I receive where the writer’s automated signature is at the bottom of the content with their head shot next to it. So in your case to appeal to the book and blog audience, I would consider experimenting adding an image of your book and your head shot at the closing remarks next to your name to see if your response rates improves. I’m assuming this won’t change the design elements of your emails. Having these visual references is primarily designed and useful for early subscribers who may not remember you or your work. After maybe their 8th opened email, your subscribers maybe familiar with you enough to where you may not need the visual references anymore. I hope this helps. Keep doing what you’re doing. It’s great work. Because I received your email this morning. It motivated me to go back and tweak a blog post I was working on one more time before I publish it this weekend. Thank you for your writing inspiration and tips! Great ideas as usual Henneke. Thank you for stopping by again, Barry! How many times have I used the first words that came to mind? More times than a teenager takes a selfie. There you go again, encouraging me to think. I hope I don’t hurt myself. Time to paint some word pictures. I hear you Henneke. Thanks. I never used to think of myself as a writer either. When I just started blogging, my first posts we’re rubbish! My writing skills evolved over time through studying the art of writing, doing it and developing my own voice. 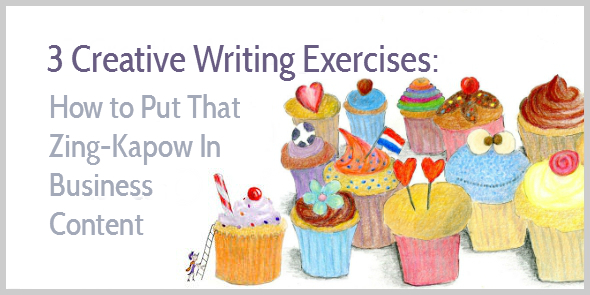 These creative writing excercises are fantastic. The first one is my favorite. It really fires up the brain to start making connections which is what creativity is all about. I’ve heard Kevin Kelly mention that writing actually helps him to think more clearly on a Tim Ferris podcast, I have a similar experience. Metaphors and good ideas just pop into my mind when I just make myself sit down and write. It’s like I’m tapping into my subconscious. Other times I consciously construct them or fine-tune them to make my posts juicier after writing my first draft. The more time I spend on polishing and letting it simmer, the better my writing gets. I relate to the emphasis you place on fun and play because they not only take away a lot of the resistance that writers often have, but they are also resourceful states to be in. I also happened to notice that you said you’re thinking about writing a whole book of these kind of excercises. I would absolutely purchase that, Henneke. Thank you for stopping by again, Jasper. I hope you’re enjoying your weekend, too! Henneke I like your #3 advice to write freely and quickly before you get into the habit of self-editing for ‘perfection’ on screen. It is much easier to read hard copy and add excitement away from the PC. Thanks again for more good stuff! Yes, I don’t know why PCs sometimes seem so bad for creativity. Is that in our minds? Or is it something about the typing or the monitor? Lovely Post. Am looking forward to thế creative ebook you promised to make. I am a budding writer and work in the eLearning industry. Loved your post. Look forward to more interesting stuff fro you! Hi Sujata, I’m glad you like this post. Welcome 🙂 And thank you for stopping by! FABULOUS ideas! Got my motor running!